FOR YOUR CONSIDERATION Until May 21st, you can vote every day in the Partners In Preservation initiative, a program that will award grant money to certain New York cultural and historical sites among 40 nominees. Having trouble deciding which site to support? I’ll be featuring a few select sites here on the blog, providing you with a window into their history and hopefully giving you many reasons to visit these places, long after this competition is done. Read about other candidates here. Astoria Pool is the largest venue for swimmers in New York, outside of the Hudson and East Rivers and, of course, the ocean. Its location in Astoria Park is certainly theatrical, parallel with the river and in sight of two spectacular bridges (the Robert F. Kennedy and the Hell Gate) that sail over to Randall’s Island. For a public pool, its so big (330 feet long, with a supposed capacity of 3,000 people) that it might be more comfortable in a theme park. 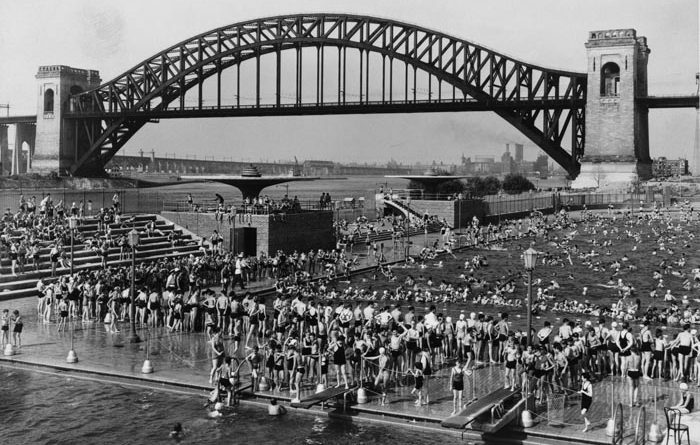 The pool, the park, one of the bridges (the RFK, aka the Triborough) and the roads you probably used to get to thee places were all 1930s projects overseen by New York Parks Commissioner Robert Moses. 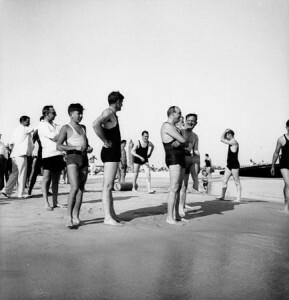 But the real fuel behind the creation of Astoria Pool was the Works Progress Administration, a federal agency that infused billions of dollars into local communities during the Great Depression. The money came just as Moses (at right, in a swimsuit, at Jones Beach) was ascending into his various governmental roles in city and state government. The result was some of his most earnest and arguably most effective projects. Perhaps his legacy might not be as hotly debated today had he stopped with his greatest hits of the decade: the Triborough, the parkways and the many miles of parkland scattered throughout the city. 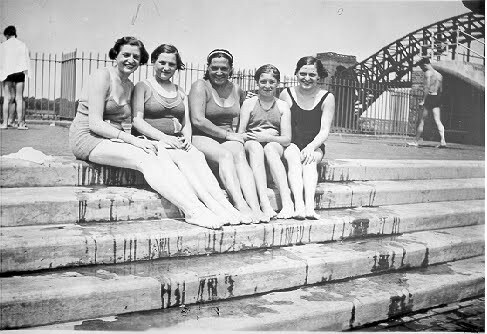 Astoria Pool, with its subdued Art Deco design, was the grand model for all the new pools in the other boroughs. And it was certainly the most popular, from the moment it opened in July 1936. But Moses wasn’t just concerned with public accommodation. 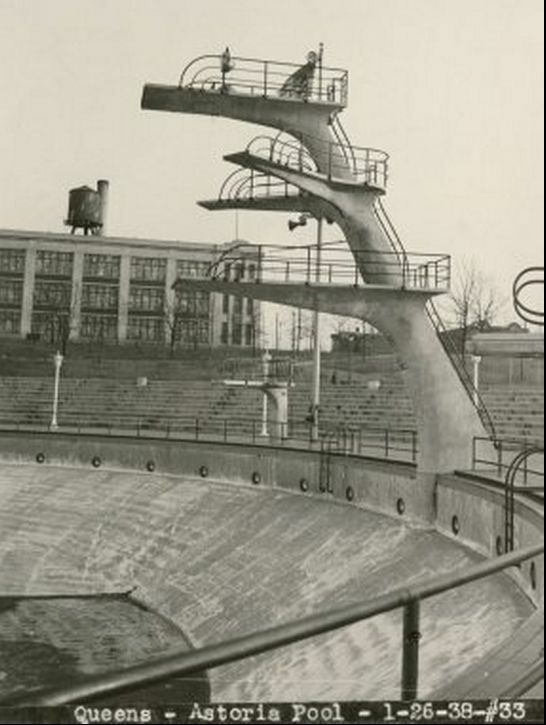 He had different intentions for this pool, reflected in the semi-circle of bleachers and that spectacular diving platform stretching like a plant over a deeper half-moon pool. The Astoria Pool was meant to create swimming superstars. 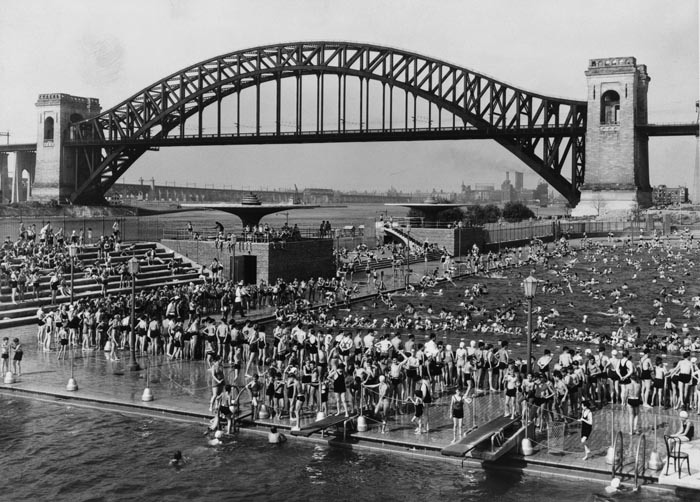 Two days after its opening, on July 4, 1936, Astoria Pool hosted the U.S. Olympic trials in swimming and diving. From these events, victors went straight over to the Games, hosted that year in Berlin. Olympics trials returned to Astoria Pool in 1952, and again in 1964, producing athletes that again nearly swept the diving events in the Tokyo games. Swimmer Don Schollander went on to win 4 golds that year, the most of any athlete in 1964 and the most medals won by an American athlete since Jesse Owens. But, as it would turn out, the biggest swimming celebrities fostered from the Astoria Pool were neighborhood boys. Imagine being a kid in Astoria, Queens, in the early 1940s, living next to a swimming pool that had helped produce the world’s greatest swimmers! A group of local swimming enthusiasts looked at Astoria Pool’s extended diving platform and saw a opportunity to entertain, forming an athletic-comedy group called the Aqua-Zanies. 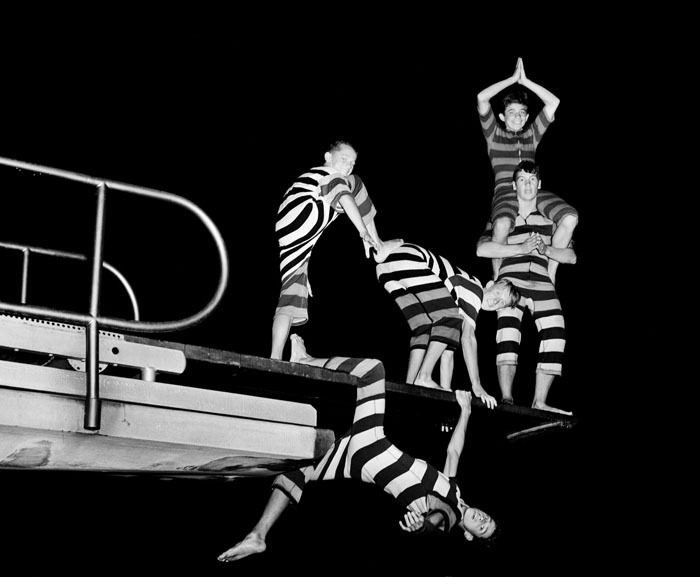 Garbed in matching stripped ensembles, the teenagers performed wacky acrobatic stunts from off the platform — darting, twirling and sometimes bellyflopping into the water below. They soon became ‘America’ leading water comedians‘, performing throughout New York and even going on an international tour in the early 1950s. Several Aqua-Zanies went onto more legitimate swimming careers. And certainly these effortless performance have inspired hundreds of others to leap from the Astoria diving platform with equal attempts at gravity-defying levity. Although the swimming pool has remained a important part of the community even to this day, that diving platform, weathering decades of elemental abuse, was shut down in the 1970s and has become something of a beloved ruin. 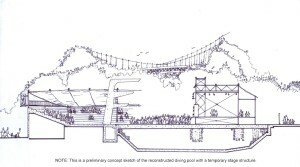 It was recently announced that the diving pool would be transformed into a theatrical performance space, its semi-circle shape and surrounding bleachers evoking an ancient Roman stage. 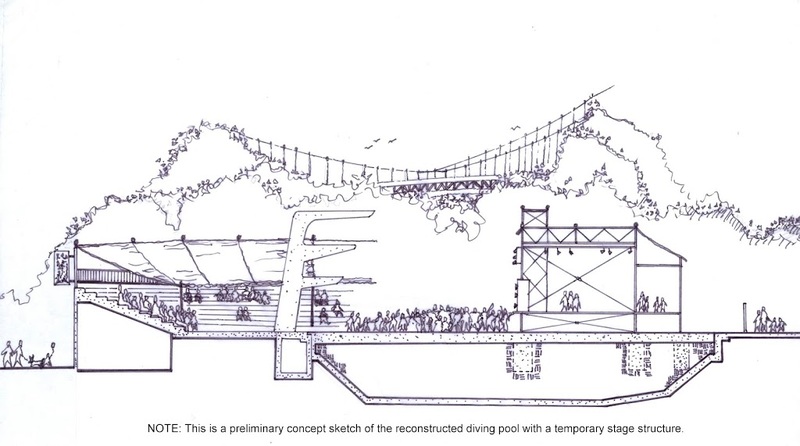 With grant money from Partners In Preservation, the Parks Department hopes to rehabilitate the Olympic high dive diving platform — not for the service of future Olympians, but as a monument to the pool’s storied sports history. 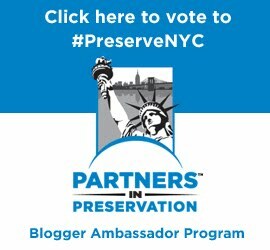 Disclosure: I have partnered up with Partners in Preservation as a blog ambassador to help spread the word and raise awareness of select historical sites throughout the tri-state area. Though I am compensated for my time, I have not been instructed to express any particular point of view. All opinions expressed here are strictly my own. And since writing about New York landmarks is kinda my thing anyway, I’m thrilled to share my love of these places!